Today, is the announcement of the general availability of new and enhanced releases of the industry-leading portfolio of cloud management solutions (read the press release). The products available today include VMware vCloud Automation Center 6.0, VMware vCenter Operations Management Suite 5.8, and VMware IT Business Management Suite. It is very gratifying to be delivering to the market the products we originally unveiled at VMworld 2013 Europe in Barcelona in October (press release). This GA marks a major milestone in VMware’s mission to help our customers on their journey to IT as a Service (ITaaS) and their adoption of the cloud. It covers the whole of our cloud management portfolio with critical new capabilities – a user friendly self-service portal for agile service delivery, management of physical storage devices as well as business critical applications providing health and performance visibility across the service stack, automated cost comparisons of infrastructure services across private and public clouds, just to name a few. VMware vCloud Automation Center 6.0 offers a self-service catalog for requesting and managing all types of IT services across multiple clouds and platforms including now VMware vCloud Hybrid Service and OpenStack to provide customers with on-demand access to any service and reducing time to value. VMware vCenter Operations Management Suite 5.8 extends visibility and insight into the performance of applications running on Microsoft Hyper-V and Amazon Web Services, improved performance analytics for a broad range of storage arrays, and enhanced support for business critical applications including Microsoft Exchange and Microsoft SQL Server. VMware IT Business Management Suite ITBM Suite 1.0 Standard Edition is the newest member of the VMware family of management products enabling infrastructure and business stakeholders to quickly understand the cost and consumption of their virtual infrastructure across private and public cloud environments. VMware IT Business Management Suite 8.0 Advanced and Enterprise editions introduce additional persona-based dashboards tailored to the CIO, CFO of IT, IT project managers and line-of-business owners. As customers progress to ITaaS, we believe that CIOs and IT organizations must evolve from being just builders of IT services to both builders and brokers of services. This means making strategic decisions of where to source services – whether internally on a private cloud, externally from a cloud service provider or both via the hybrid cloud. With this GA, we are further delivering on the critical capabilities required of a service broker: on-demand access to any service, cost transparency, automated operations, and the ability to deliver and manage services on any cloud and any platform. 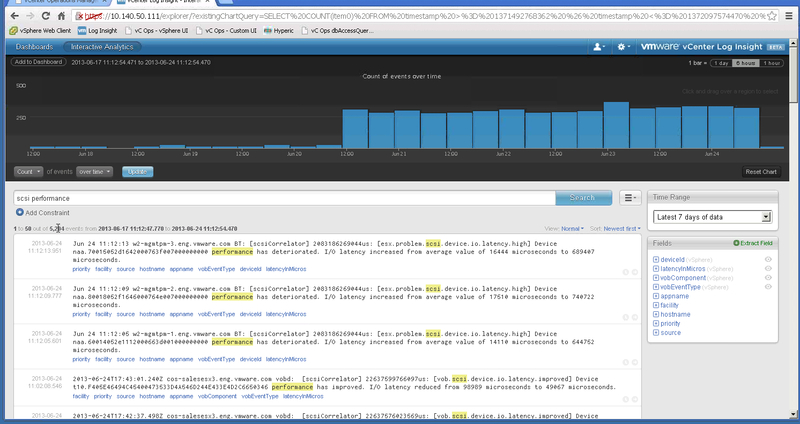 I wanted to take a moment to jot down a few cool impressions on VMware’s new vCenter Log Insight. vCenter Log Insight was recently announced, and is initially available in beta – but still providing a number of very cool features and integration with vCenter Operations Manager. I want to first highlight the easy to use query language. In this example we are investigating an intermittent SCSI / latency problem – using the power of logs, we were able to quickly find the common “unstructured” data thread. I liked this simplistic approach rather than having to learn and support a complex / proprietary query language as in other tools. By simply entering “SCSI performance deteriorated” we start to pick-up quite a bit of data and I can see the frequency these events have hit, as well as the spike at June 20, @ 12pm– now I can start refining this query to fit my needs. I can even drill-down using linked “extracted fields”, as well as extract additional fields based on how you wish to refine your query making it repeatable and easy to use/learn. Next, it would be helpful to understand things like average SCSI latency over time – refining the query even further you, can choose “average” function over a specified period of time. Furthermore this may be a query that you may want to run multiple times, therefore you can add it to a new, or existing dashboard. Also adding constraints, or thresholds, gives the user the ability to monitor queries and filter out data that is not significant. 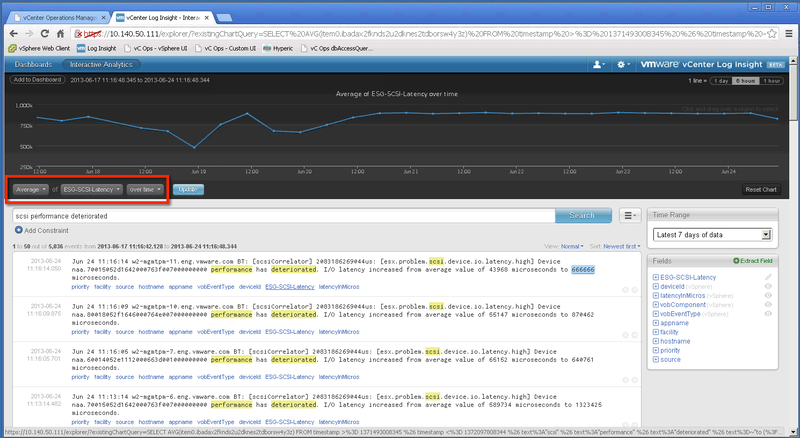 Finally, and this is the cool part, vCenter Operations Manager integration allows Log Insight data to vCOps, giving a single view into the structured and unstructured performance data allowing for a more comprehensive and accurate view of your virtualized / cloud and supporting physical infrastructure. 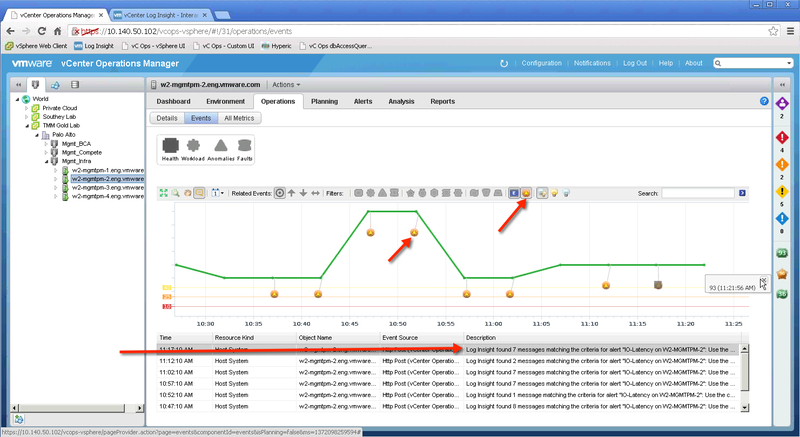 For more information check out the vCenter Log Insight product web page and view the introduction video. 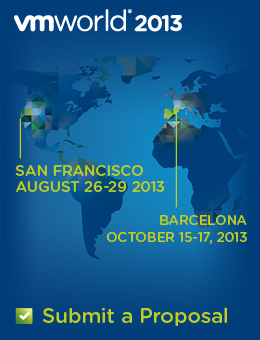 VMworld 2013 – Call for Papers Ends on April 12th, Have You Thought About Submitting a Session Abstract? Another VMworld is looming amongst us, coming in August in San Francisco and October in Barcelona. Currently call for papers is open until April 12th (that’s next Friday folks!) I’d like to extend an offer (similarly to what I did last year) to customers of VMware vCenter Operations to participate in a technical session on how vC Ops technology assisted in solving a particular challenging situation in your environment. I’m keeping it easy this year, I am not requiring that you battle with your corporate marketing department for permission to use your company name in any promo, or reference activities – just work with me to hone your story and present alongside myself and another seasoned VMware presenter / technologist. 1) As an accepted speaker, you receive a free pass to VMworld! Even though I am a VMware Employee, I am in the same boat as other session submitters – meaning that this call for papers proposal is NOT guaranteed to be on the VMworld session roster – VMworld general session slots are highly competitive, given high demand and limited number of slots… But I believe that working with a solid customer story weaved-in with a technical use-case and presented by both the VMware product / technical teams, alongside a customer, that we stand a good chance. If you are interested, or have any questions please send me an email – please reach out to this alias vcopsstorypromo@vmware.com and I will respond with my direct email. With VMworld 2012 San Francisco fast approaching, I thought I’d spend some time covering a few sessions and events that are worth mentioning (primarily because yours truly is involved one way or another). Join Paul Maritz as he shares how VMware is helping customers and partners thrive in the Cloud era. And Steve Herrod will discuss and demo technology at the heart of the software defined datacenter. Can’t make it to VMworld? Watch the live stream of Monday’s General Session on VMware NOW, which will begin at 8:40am PT. Steve Herrod and VMware partners take the stage to demonstrate state of the art technology that is transforming IT and enabling the mobile workforce. The live stream of Tuesday’s general session will begin at 8:30am PT. Of course, part of the richness of VMworld comes in the breakout sessions. I wanted to highlight a few sessions that I am involved (either as a speaker, or reviewer). I am extremely proud of the content, as I know it is VMworld worthy!! Part of my schedule includes plenty of time on the Expo floor. Be sure to stop by the VMware booth (you can’t miss it) and say hi! See you in San Francisco, or online!! VMware vCenter Ops, Tell your story – Win a Pass to VMworld! But that’s not all ;^) VMware is running a contest for users of the popular vCenter Operation Suite to submit their story of how they use the technology in your own organization and any unique insight of your experiences. There are 2 grand prizes, which include a full conference pass to either VMworld 2012 San Francisco (August 27-30, 2012), or VMworld EMEA (October 9-11, 2012) and are invited to tell their story at a VMworld session! I am looking forward to presenting at the Central Ohio VMUG (http://bit.ly/IUSfBE) in Columbus on May 22. I will be presenting the “Redefining the Standard for Operations Management with vCenter Operations” session (9:45-10:30) covering the vC Ops Management Suite, as well as showing off some of the new features of vCenter Infrastructure Navigator (VIN). I will also have the opportunity to work the VMware table and even demo the vC Ops suite for those who are interested, please stop by! 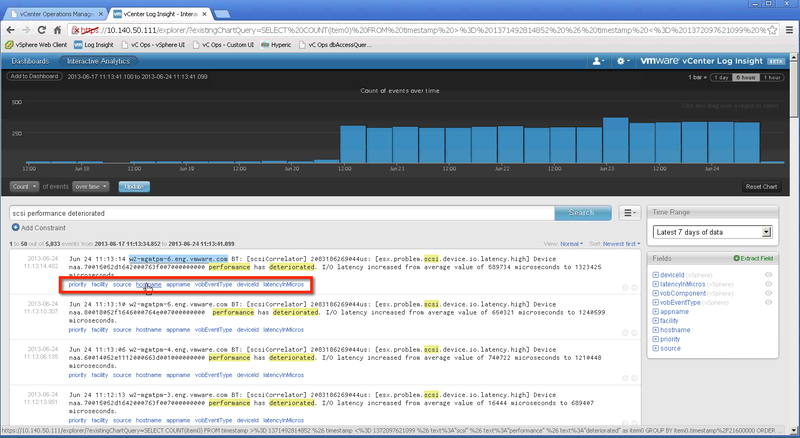 VMware vCenter Operations – Why the “Super Metric”? A recent guest Blog post for the Toronto VMUG. Thank you for posting! VMware recently announced the general availability of VMware vCenter Infrastructure Navigator 1.1 on April 26, 2012 – release notes. vCenter Infrastructure Navigator (VIN), was first introduced as part of the vCenter Operations Management Suite (Enterprise & Enterprise + Editions) in October of 2011. VIN provides application dependency visibility to applications virtualized on the vSphere platform. VIN is another great example of how the vSphere platform can be leveraged through both the ease of implementation (via an appliance) and automated discovery of all the applications virtualized on vSphere. The value extends in VIN’s ability to easily and automatically detect, discover, map and present the application characteristics and dependencies through both vSphere Web Client integration and visual maps and searchable tables. Application discovery and mapping is fully automated and updated on near real-time intervals through leveraging VMware tools – thus no agent deployment is required. The integrated “Navigator” tab provides a list of discovered services/apps giving the user the ability to view apps in a Virtual Center (VC) down to a VM – also providing filtering capabilities. VIN also provides integration into Site Recovery Manager (SRM), providing visibility into the apps that are part of a “protection group”. This level of visibility ensures a greater level of protection by understanding the impact of all the VM dependencies within and one hop away from vSphere. Mapped applications allow the user to view and investigate both incoming and outgoing dependencies within the VC and one hop from the VC to a physical server, or even residing on another VC. Additionally, VIN now supports naming of undiscovered application services that are either; not defined in the knowledge base, or are custom applications. In summary, VIN provides the additional level of application visibility required to aptly ensure performance and uptime as well as reduce risk across your mission critical vApps and virtualized application environment. VIN is part of the vCenter Operations Management Enterprise & Enterprise + Suites, and more information can be found on the vCenter Infrastructure Navigator homepage. New research by IDC analyst Mary Johnson Turner ranked VMware as the leader in the hotly contested cloud systems management software space, as defined by IDC (IDC Report #231493, November 2011). VMware leads this space with a 15.2 share of the $271.7 million spend in 2010, comprising of vCloud Director (vCD) licenses, the vCenter management platform as well as supporting management software components from the vCenter Operations suite of solutions. IDC’s definition of the cloud systems management software market spans a range of systems management monitoring, control, optimization and analytic functionality to the extent it is deployed into an automated, self-serve, consumption-aware public or private cloud operations environment.